Once the storied Charles Street Jail, The Liberty Hotel in Boston will welcome guests to Boston with the spirit of a landmark liberated following an extensive $120 million acquisition, renovation and construction process. Marrying historic architecture with the high standards of refined, modern travel, The Liberty Hotel will be New England's premier four star hotel in Boston Massachusetts. Captivating in every sense of the word, The Liberty Hotel is a Boston luxury hotel that promises an unforgettable guest experience in a unique setting second to none. There are many things to do in Boston. The Liberty Hotel is perfectly situated in the heart of Boston's Beacon Hill neighborhood and is just a few steps away from the Charles River and its Esplanade, The Liberty Hotel offers easy access to a wealth of outdoor recreation, unique shopping, entertainment and downtown Boston. 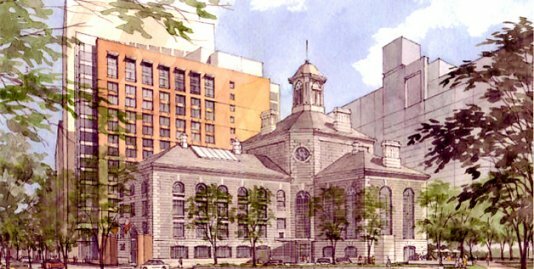 In Short Of The Liberty Hotel's 300 guestrooms, 20 are located within the old Charles Street Jail, with the remaining housed in a new 16-story tower. The modern rooms -- each of which has a flat-screen TV -- are tastefully appointed, with many enjoying river views. Located near the Esplanade, and next to the Charles Street T stop, the hotel provides an ideal home base for tourists. On-site drinking and dining options are set to include Clink (small plates), Scampo (upscale modern fare by Lydia Shire) and Alibi (a nightlife destination, courtesy of Patrick Lyons). Have a drink in ALIBI, a sensual ground floor bar in an old cell block serving custom cocktails and operated by renowned nightclub and restaurant owner, Patrick Lyons.